Great for wiring up your AC from your inverter, includes 2 USB ports for charging your devices. 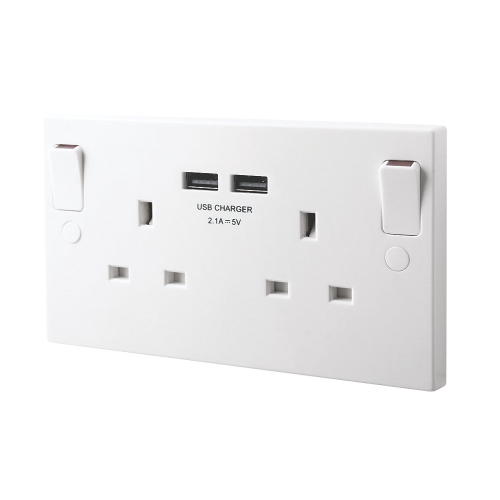 White moulded outboard rocker socket with 2 x USB ports, 2.1A. Ideal for charging iPads, iPhones, tablets, mobiles, cameras and more. Features angled, in-line terminals and includes backed-out captive screws for easy installation. USB outputs: 2.1A shared, 5V, Type A. Requires minimum 25mm depth wall box. Fixings supplied. BS 1363-2, EN 60950-1.